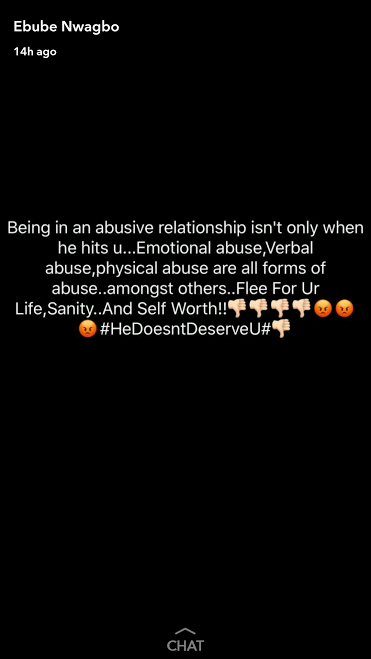 Home / Celebrities Gist / Being in an abusive relationship isn’t only when he hits you, Emotional abuse, Verbal, Physical abuse are all forms of Abuse - Nigerian Actress Ebube Nwagbo Speaks Out Against Domestic Violence! 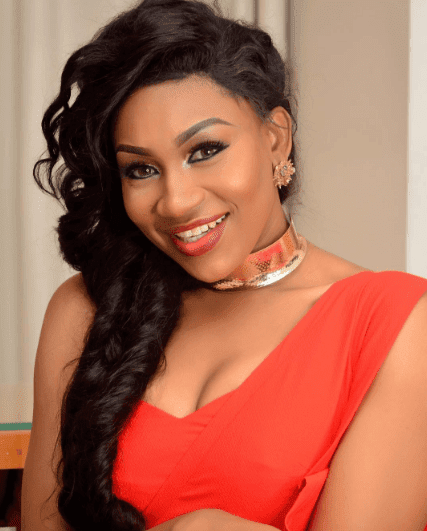 Being in an abusive relationship isn’t only when he hits you, Emotional abuse, Verbal, Physical abuse are all forms of Abuse - Nigerian Actress Ebube Nwagbo Speaks Out Against Domestic Violence! Just last week, singer Peter Okoye, one of the P-square brothers took a stand against Domestic violence, now, Popular Nollywood Actress Ebube Nwagbo has joined the movement. 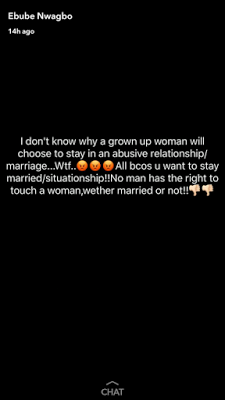 The gorgeous actress took to her Snapchat account to express her opinion regarding Domestic Violence. She stated the she does not understand why a grown woman would want to to stay in an abusive relationship, and also, emotional, verbal and physical violence are all forms of domestic violence and anyone caught in that situation should flee for their lives. “I don’t know why a grown up woman will choose to stay in an abusive relationship/marriage… Wtf. All becos you want to stay married/situationship! No man has the right to touch a woman whether married or not”. Being in an abusive relationship isn’t only when he hits you. Emotional abuse, Verbal, Physical abuse are all forms of abuse.. amongst others..Flee For Ur Life,Sanity..And Self Worth! !, #HeDoesn’tDeserveU. 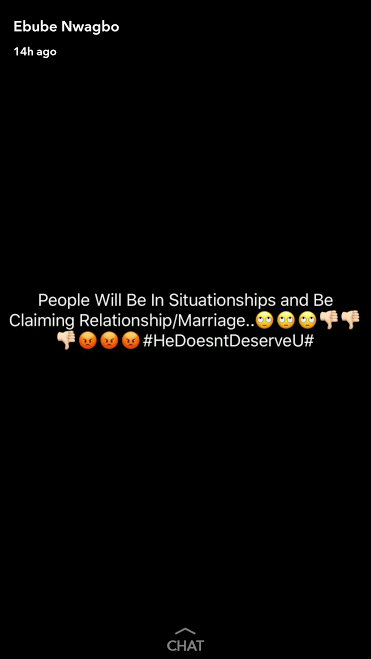 People will Be in Situationships and Be Claiming Relationship.Marriage. #HeDoesntDeserveU#”, she added. 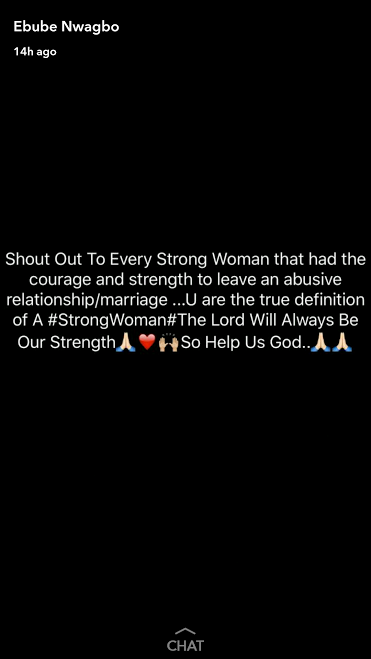 "Shout Out To Every Strong Woman that had the courage and strength to leave an abusive relationship/marriage …U are the true definition of a Strong Woman. The Lord Will Always Be Our Strength. So Help Us God".